The discussion of the Late Byzantine monastic church of the Kariye Camii focuses on the period of rebuilding and expansion during the years from ca. 1316 to 1321. Theodore Metochites, minister and subsequently prime minister of the Byzantine Empire, during a short period of cultural revival, undertook the rebuilding and renovation of the Kariye Camii The greatest intellectual of his age, and thus knowledgeable and involved, he was wealthy and powerful and therefore in a position to assume the patronage of this church. Metochites early fourteenth-century rebuilding included the reconstruction of the naos dome; the pastophoria; the addition of a two-storied annex to the north, an inner and outer narthex to the west; and the parekklesion to the south. The appearance of incongruity in the structure resulted from several factors including the use of the Middle Byzantine core of the building, the sloping site, as well as the varying functions of the ancillary chambers. The monastery was dedicated to the Virgin, as Theodore Metochites indicated in a long poem he wrote to the Virgin: "To thee I have dedicated this noble monastery, which is called by thy precious name of Chora." The naos of the church, however, was dedicated to Christ, as is suggested by the mosaic of Metochites presenting the church to Christ. Located at the edge of Constantinople near the Land Wall of Emperor Theodosius, the Kariye Camii gained in importance due to its proximity to the main imperial residence at the Blachernae Palace (mostly ruined). In addition to its architectural significance, the Kariye Camii also preserves one of the finest and most extensive cycles of Later Byzantine mosaic and fresco decoration recounting the lives of the Virgin Mary and Christ. Older phases of the 6th and 9th centuries are extant in the foundations; the naos superstructure dates from the 11th to 12th centuries. During this period, there was a transition from the cross-in-square plan to the cross-domed naos. The Kariye Camii seems to have suffered during the Latin Occupation of Constantinople (1204–61). Around 1300, the scholar Maximos Planudes complained about the deterioration of the monastic library. Shortly thereafter, the Patriarch Athanasios stayed at the Kariye Camii when visiting the emperor and complained, "I have at least twenty followers who have no place to sleep and are freezing and covered with mud. If my cell were able to hold a windmill, the monks of the Chora could grind a lot of flour." The exterior of the Kariye Camii is characterized by an undulating roofline, pumpkin domes, belfry, and an open arcade on the west facade. Symmetry was not a major concern. Complexity was more important than monumental unity. Individual elements of the building are expressed visually on the exterior. The west facade has also been radically changed over time, the arches were blocked, and within a few decades of Metochites' construction three were transformed into arcosolia for tombs. The complexity of the exterior is reitered in the interior. Joins in the marble revetments sheathing the interior walls of the naos do not correspond to the structural divisions introducing alternative surface rhythms. Interior decoration is composed of bits and pieces connected by a decorative veneer; for example, the mosaic scene of Joseph Taking the Virgin to His House in which it is unclear whether he is coming or going. Much of this surface complexity reflects the intricate writing style of the founder, Theodore Metochites. Note Metochites' criticism of his rival Nikephoros Choumnos: his writing suffers from "excessive clarity." Myrelaion. The principal interior spaces include: The outer and inner narthexes, located on the west facade, served as entry vestibules. The narthexes preserve mosaics, marble revetments, and sculpture. Outer Narthex (exonarthex): the principal point of entry into the church, was opened by an arcaded portico facade and originally had a belfry at the southwest corner. The outer narthex contains mosaics with scenes from Christ's infancy and ministry. Naos: the main space for worship and ritual, in the center of the building and covered by a dome on pendentives. Bema: The eastern extension of the naos, also called the sanctuary, where the altar was located, directly in front of the apse. It was originally separated from the main part of the naos by a marble screen. Prothesis and Diakonikon: Located on each side of the bema were side chapels called pastophoria, with the prothesis to the north, where the Eucharist was prepared, and the diakonikon to the south, which was a vestry. By the fourteenth century, the diakonikon functioned as a private chapel. parekklesion: Along the south side was the parekklesion, or subsidiary chapel, which functioned as a funeral chapel for Theodore Metochites and his family. The parekklesion represents one of the finest achievements of Palaiologan architecture. Divided into two square bays, flanked by a barrel vault to the west and apse to the east, the two bays are covered by a tall, windowed dome and a lower domical vault. The fresco cycle, dedicated to the Virgin and Christ, is almost entirely preserved. Note the importance of the subsidiary spaces including the narthexes and parekklesion, arranged in an L-shaped configuration wrapping around the naos. These spaces are characterized by their small-scale and asymmetrical relationships. The history of the building is important to its appearance reflecting the relationship between old and new components as they were melded into the final form of the building. The new echoes, frames, and enhances the old. 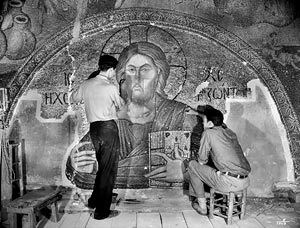 A Byzantine church was not considered complete until its interior was decorated with mosaic or fresco, usually with complex icons and cycles of narrative scenes from the old and New Testaments. The architecture was animated and given meaning by the pictorial decoration. The selection and placing of images interacted with the services celebrated in the church to emphasize the message of the liturgy. The Kariye Camii displays a close interaction between the architecture and the mosaics and frescoes, suggesting a direct working relationship between mason and artist. a. Design of the dome to suit different media, and Kariye-type domical vaults, with flattish surfaces for narrative scenes. b. The Deesis mosaic and its position in the design of the complex—a dedicatory panel; its prominent position created numerous irregularities in the building; probably meant to be a founders' chapel. c. Entry sequence in the narthexes with scenes from the Life of the Virgin and Christ. Note the spatial relationships of scenes and the idea of containment. d. The parekklesion with temporal layering; the architectural space has become an integral component of the iconographic program. A temporal theme appears in the frescoes of the parekklesion, the funeral chapel for the burial of Theodore Metochites. Here we find the promise of salvation dramatically emphasized by imagery that evokes past, present, and future as if occurring simultaneously. Together with the programs of the narthexes, they form a series of interrelated narratives, and the frescoes of the parekklesion serve in many ways as the culmination of the other cycles. As one moves into the chapel, there is a subtle transformation of emphasis from the Incarnation of Christ to Salvation, with numerous references to the subjects represented in the narthex cycles. The program of the parekklesion begins with imagery devoted to the Virgin, but the message is shifted to the promise of Salvation for the faithful. The layers of time in the frescoes emphasize the eternal reward of the faithful in the Land of the Living. The past is represented by scenes from the Old and New Testament: the prefigurations of the Virgin refer to the Incarnation, but more importantly emphasize her role in Salvation. The program culminates in the dramatic scene of the Anastasis, which links the two levels of the past, as Christ raises up Adam and Eve. These scenes of the biblical past act as a preparation for the future, represented by the Last Judgment in the eastern domical vault, in which the dead are called to their final reckoning at the end of time. The Anastasis, based on the apocryphal Gospel of Nicodemus, was the standard Byzantine representation of Christ's Resurrection. Christ strides boldly, clad in radiant white, lifting Adam and Eve from their sarcophagi. Beneath his feet, Satan lies bound and gagged, and the gates of hell are scattered about. The unique representation of the Last Judgment fills the domical vault and most of the eastern bay's supporting walls. Little in the iconography is unusual: the Last Judgment follows earlier models. Here the emphasis is on the future, the "last things"—-death, final judgment, immortality in heaven or eternal punishment in the fires of hell. Christ raises his right hand to show that those on his right are saved, whereas the downward gesture of his left hand indicates that those on his left are damned. To Christ's right are scenes of heavenly reward. The fiery stream issues from the Christ's left side, leading to the lake of fire and torments of the damned in Hell. To emphasize the dual dedication of the Kariye Camii, with the church dedicated to Christ and the monastery dedicated to the Virgin, as well as the significance of the Virgin to Salvation, there is a sort of "women's equality" in the decoration: Christ and the Virgin appear regularly in pendant images. Their lives are set parallel in the two narthexes, and their images in the dome medallions are matched sets. The Deesis mosaic shows Christ and the Virgin with an imperial male and an imperial female donor kneeling at their feet. In Christ's miracles, those involving men are often set opposite those involving women, this is clear in the south bay of the inner narthex. In the parekklesion, scenes of Christ raising from the dead the daughter of Jairus and the widow's son flank the apse. Pendant images of Christ and the Virgin appeared on the walls below. And the parekklesion apse itself shows the Anastasis with Christ raising up simultaneously Adam and Eve, the scene was more commonly Christ raising Adam while Eve stands by. Because Christ was regarded as the new Adam, and the Virgin the new Eve, the Anastasis provides a vivid culmination to the decorative program, as well as to the sub-theme of gender symmetry. Restoration Photographs from the Dumbarton Oaks Archive. The sanctuary of a Byzantine church that enclosed the altar. Access to this area, often with a raised floor love and separated from the rest of the church by a screen or chancel barrier, was restricted to the clergy. The inner narthex, or transverse vestibule of a Byzantine church. The outer narthex, or transverse vestibule of a Byzantine church. The term can refer either to a church or, more commonly, to the central space for worship inside a Narthex (gr., "stalk"): in Byzantine architecture, a term that refers to the transverse vestibule of a church at its entrance facade. Subsidiary chapel, usually attached to the side of a Byzantine church, which could serve a variety of different functions. At the Kariye Camii and the contemporary Fethiye Camii (Pammakaristos monastery), the parekklesion was used as a funerary chapel for the ktetor, or founder, of the church and his family. Download an expanded glossary as a pdf.